I brought Deb out to Donadea Forest Park in the spring to see the castle. On our way back we were pleasantly surprised to come across the round tower at Taghadoe. I had been meaning to call here on numerous occasions. St Tua, also known as Ultan Tua or Ultan the Silent, probably founded a monastery here around the beginning of the 8th century. Taghadoe derived its name from 'Teach Tua' meaning House of Tua. 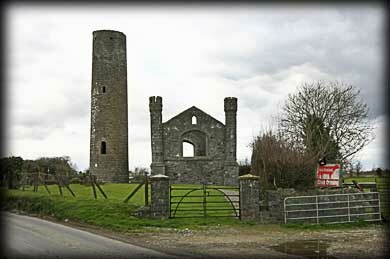 St Tua was also an abbot at nearby Clane monastery and died in 770 AD. 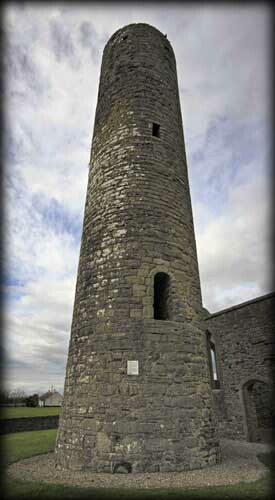 The round tower stands at almost 20 metres tall and is built from rough coursed limestone. Although there has been some renovation carried out on the tower, it still remains capless. There are three windows in total and a south-south east facing doorway situated 3.56 metres above ground level. There is raised moulding present on the south side of the doorway and a very worn head carving is just visible above the keystone. The church next to the tower is fairly modern, built in the 1830s. I hope to call back to this site later in the summer, a morning visit may be needed to get good images of the doorway and the carving. Situated:: From Maynooth head south on the R408. After 2k turn left towards Bryanstown. About 1.5k down here turn left again. The tower is 600 metres down here on your left. Discovery Map 50: N 9234 3456. Last visit March 2011. Door: Above ground 3.56m. Type: Arched. Features: A worn head carved above the keystone.